Catch your favorite AFC and NFC players as they prepare for the game. Practices are free and open to the public from January 23 – 25, 2019. Fans will be allowed into the AFC and NFC practice seating on a first come, first served basis. If the practice seating areas reach capacity, fans may stand and watch AFC and NFC practices from limited availability areas in the north end zones of each field. The 2019 Pro Bowl Experience at ESPN Wide World of Sports Complex, is a free, interactive fan zone with fun activities for the whole family. Fans will be closer to the action with new activities, immersive exhibits, and more. Opens daily at 10am, January 23 – 26, 2019. NFL FLAG Championship games will be held January 25-26, and on the 26th, Pro Bowls players will take part in a celebration of football as they serve as honorary coaches at the NFL FLAG Championships, support local Special Olympics, and participate in Play Football Clinics with local youth. The 2019 Pro Bowl Skills Showdown will take place January 23, but if you can’t get your hands on one of the free tickets, the event will air on ESPN and Disney XD Thursday, January 24 at 9pm ET. 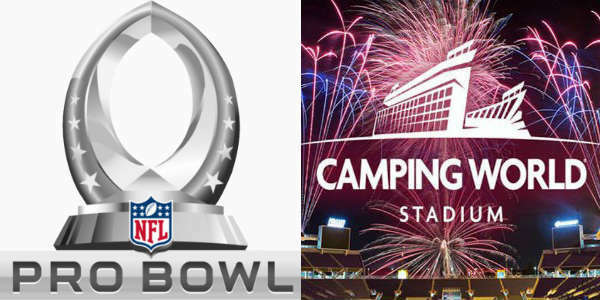 For more information on Pro Bowl Week in Orlando, including a full schedule of events, visit NFL.com/ProBowl.